Show Racism the Red Card - New Patrons for Show Racism the Red Card Scotland! New Patrons for Show Racism the Red Card Scotland! Show Racism the Red Card is delighted to announce two new patrons in Scotland. Livingston FC Manager Gary Holt and Ross County FC Manager Steven Ferguson have agreed to become patrons to help raise the profile of the campaign in Scotland. They are joining a long list of names which includes a number of ex professional football players, current football players, ex professional managers and current managers such as, Craig Brown, Derek McInnes, Craig Gordon & Craig Levein. Becoming a patron is a key role in activity promoting the campaign in the media, particularly by showing support during our Fortnight of Action in October by wearing a Show Racism the Red Card badge at all media appearances. Gary and Steven will be roles model for young people in challenging racism and inequality. Livingston FC and Ross County FC have been strong supporters of the campaign for many years and we appreciate them helping promote our work in the future. 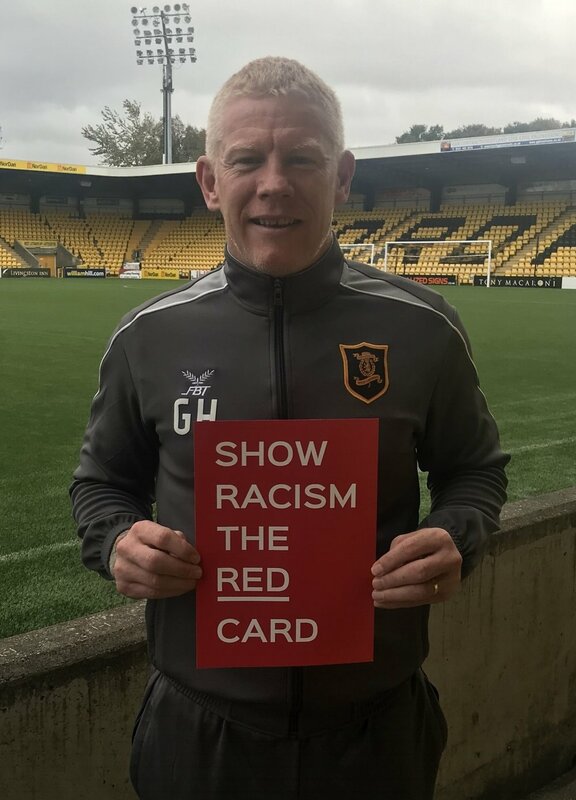 Gary Holt Livingston Manager, “Delighted to follow in the tradition of many other coaches and managers supporting Show Racism the red Card.